We’ve always loved smoothies, but this Weight Watchers breakfast strawberry banana smoothie is a classic flavor combination that everyone loves. Strawberries and bananas go hand in hand, and they make a great way to get some extra fruit in your diet, and provide a satisfying Weight Watchers breakfast option. This post may contain affiliate links. I earn a commission from purchases made through this link. My friend Emilee made this beautiful smoothie for her family a few weeks ago and was willing to share with me here. She has three kids (another on the way), and it was a hit with all of them. It’s important to me that all of our Weight Watchers recipes are not just great for the person who is dieting, but also easy to make and satisfy the entire family. Basic fruits and juices are a great base for any Weight Watchers breakfast smoothie. Some like to add in some Greek yogurt for added low-fat protein. While it is not figured into this recipe, it’s a great choice if you are wanting to boost your protein. Another option is to do something like our great Weight Watchers Breakfast Green Smoothie recipe that includes spinach. Spinach and Kale are great sources of protein as well as tons of other healthy vitamins. We use a Ninja Blender when we make smoothies at home, but as you can see a basic household blender works great for this! A tip to make this a bit easier and make the smoothie more like a milk shake, is to prep your fruits ahead of time and freeze them in portion bags. You can grab a bag from the freezer, drop into your blender with juice and it gives it a colder and thicker texture plus saves you time on a busy morning! 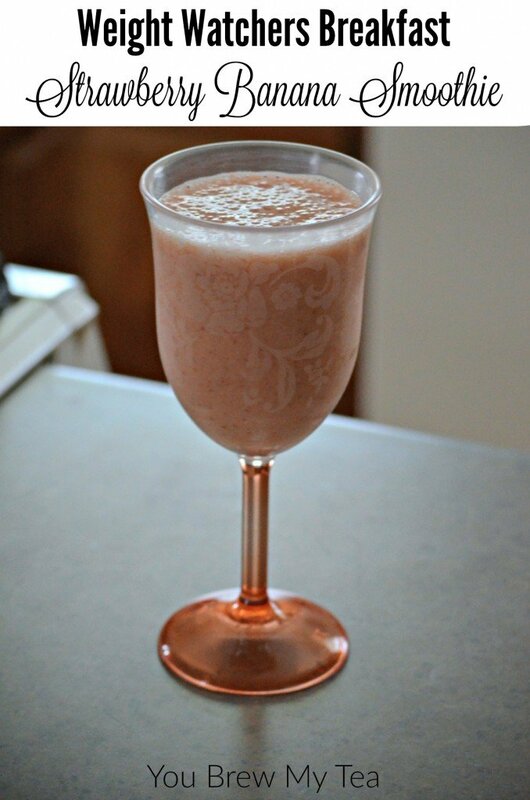 Add this simple and popular Weight Watchers breakfast strawberry banana smoothie to your routine on a regular basis. You’ll ge great fiber, tons of antioxidants and of course, some Vitamin C. Serve with some of your favorite homemade breakfast sausage, our Veggie Egg Scramble or even a breakfast burrito for a delicious and healthy breakfast that will satisfy and help you to stay on track the rest of the day! Add all ingredients in blender and pulse until smooth. 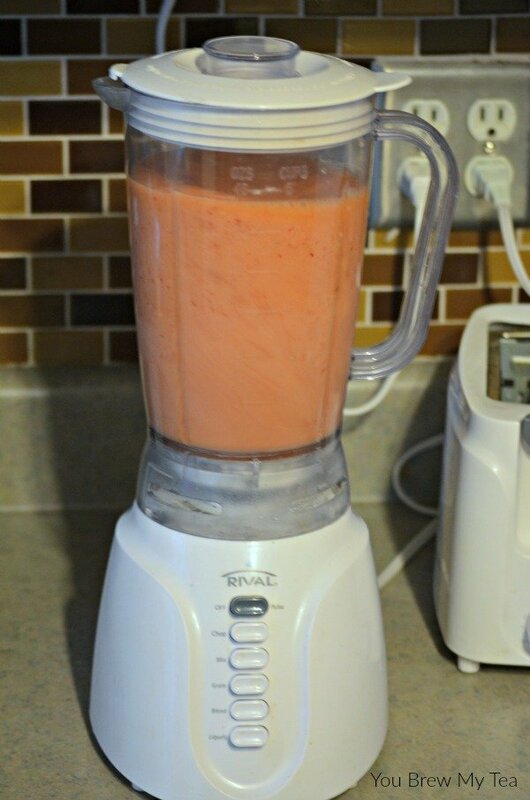 This is a simple breakfast smoothie. It is delicious, easy and full of nutrients. It works perfectly into any diet plan and is family and kid friendly. You can make this easy smoothie on a regular basis as a great breakfast option or as an alternative to ice cream or other sugar-laden treats. 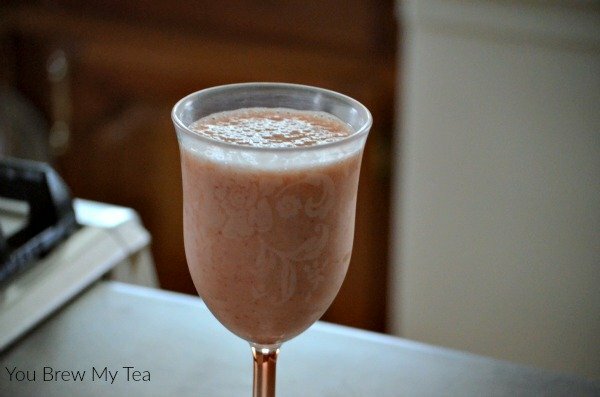 This Weight Watchers breakfast strawberry banana smoothie is a great option that everyone will love! Fruit is typically free on Weight Watchers, but in smoothies, it does count thus the higher points values. I use the Recipe Builder within the plan since I am a member to calculate this recipe. You may want to invest in the Weight Watchers SmartPoints Calculator if you are concerned about it being the most accurate figure. Check out our other favorite smoothies and breakfast options! 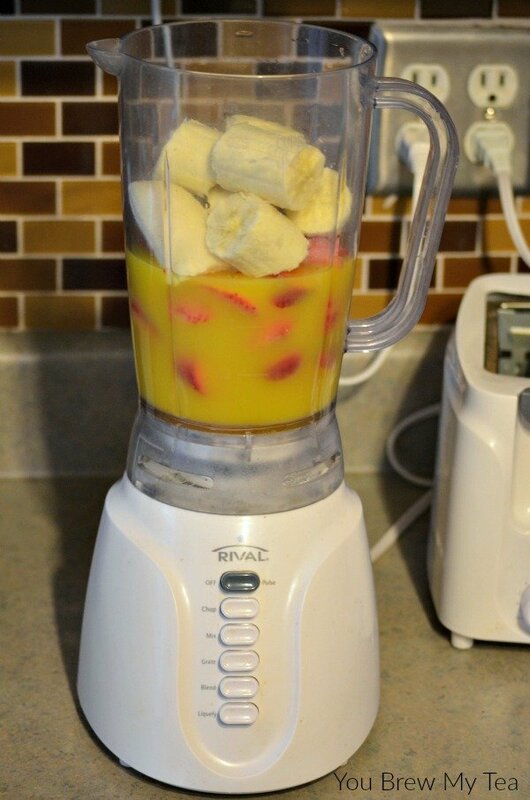 What a super easy smoothie idea! Thanks for sharing at Merry Monday! I love the way you presented it! The glass makes it that much more inviting. Thanks for linking up at delicious dishes recipe party! how many calories in the strawberry banana smootie. how many points are if i use natural orange juice in stead of the orange juice bottle? Points would remain roughly the same. It is calculated using Simply Orange which is just orange juice without added sugar, etc. Thank you. Is the sugar content high with bananas and orange juice? Why couldn’t you use the 30 calorie Almond Milk instead of orange juice? You can adjust as you prefer. That is just our personal recipe.